This is probably the last major research I will do before beginning to organize and write Part Two of my new novel. It is a superb place to finish. Turner has done a magnificent job reporting the events and capturing the feelings of so many of the participants in the momentous events of January 1933. 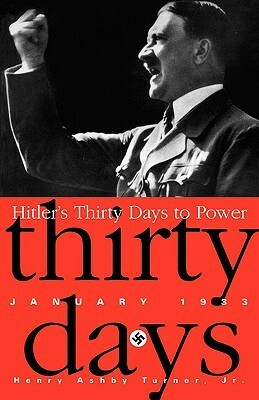 It is a fascinating, day-to-day, person-by-person review of the 30 days that ended with Hitler being appointed Chancellor of Germany on January 30, 1933. Turner’s conclusions in the final chapter pull no punches. 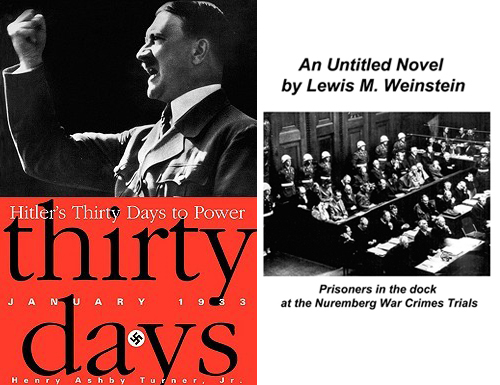 He assigns culpability and guilt, making it clear that it was the ignorance, ineptitude, personal grudges, mendacity, and ambition of the characters in power (mainly Hindenburg, Schleicher and Papen) who gave Germany to Hitler and thus Hitler to the world. Those who supported democratic government in Germany simply gave it up without much of a fight, often because they were fighting with each other. It is true, Turner asserts, that Hitler played the weaknesses of the others brilliantly, but he was only playing the cards he was dealt. … at the beginning of January, Hitler was judged to be finished … Frankfurter Zeitung – Jan 1, 1933: The mighty Nazi assault of the democratic state has been repulsed. The republic has been rescued. … There was widespread disillusionment in the Nazi ranks. Many who had joined in expectation of sharing quickly in the spoils of victory were beginning to despair: resignations occurred daily; dues arrived irregularly. … Then the ambitions of former-Chancellor Papen and current Chancellor Schleicher, and the gross incompetence of President Hindenburg, re-opened the door for Hitler. Papen convinced Hindenburg that Hitler was ready to join with conservative forces in a coalition cabinet [this was not true!]. Hindenburg concluded that Hitler’s involvement precluded Schleicher, which made Hindenburg part of a conspiracy to depose the chancellor (Schleicher) he had just appointed. … Hitler maintained his composure in 2nd half of January; he betrayed no loss of nerve, retaining his unshakable belief in his calling to lead Germany. … on Jan 30, after a dizzying series of events well reported by Turner … Papen led the assembled group up the stairs to Hindenburg’s office. At about 11:30, Hindenburg administered the oath of office to Hitler. … Hitler had not seized power or won it at the polls. It had been handed to him.